—and to keep a king fit! Medieval feasts were not all bread, meat, and cheese. Fruits—and especially vegetables—were served as side dishes or were cooked with the meat. In fact, Medieval cooks didn't make the same distinction between fruits and vegetables that we do. We often find recipes that used apples in a stew or turnips in a sweet dessert. Some of today's favorite vegetables were not yet introduced to Medieval Europe. These include potatoes, tomatoes, bell peppers, and maize corn. However, people still had a great variety of vegetables to choose from in their gardens and public markets. They undoubtedly ate more fruits and vegetables than we do now since meat was expensive and the landlords taxed grain and flour. Vegetables, on the other hand, were free, a gift of the earth, and any excess from the garden could be sold. Seasonal vegetables: Some vegetables were only available while in season, so people looked forward to eating them. Asparagus, artichokes, broccoli, Brussels sprouts, green and yellow beans, cauliflower, celery, cucumbers, fennel, some varieties of crookneck squash (which they called gourds), peas, melons, okra, and rapini were usually served raw, steamed, or boiled, but occasionally they were also deep fried or roasted. Leafy vegetables: This group was available more often since they could be continuously harvested from Spring until winter. Green, white and red cabbage, sorrel, lettuce, chard, collards, dandelion, mustard greens, turnip greens, chichory, radiccio, endive, escarole, spinach, parsley, cilantro, and many other herbs were served raw in salads, boiled in soups, stewed, baked, sautéed, dipped in batter and fried, or pickled to be eaten later. They also ate flowers like violets, daylilies, waterlilies, borage, fruit blossoms, mallows, sweet peas, marigolds, angelica, and roses. Root vegetables: Carrots, turnips, rutabagas (called swedes), radishes, beets, yams, and parsnips were highly favored vegetables because they were easy to grow and could be stored all winter. Root vegetables were prepared in a variety of ways; baked, fried, boiled, braised, sautéed, steamed or eaten raw. Onions, leeks, shallots, garlic, and chives formed another class of root vegetable prized for their flavors and storage properties. Their leaves and flowers were also edible and could be dried for use all year long. Vegetables were served with sauces, gravies, dressings, and glazes of all kinds. Verjuice was a tart sauce that was as common in the Middle ages as ketchup is now. It was made of mashed unripe grapes and the green juice of various herbs and vegetables. Nuts and dried fruit were often cooked with vegetables. Many vegetable dishes had sauces made with distilled alcohol, beer, or wine. Others were sweetened with sugar or made savory with herbs and vinegar. 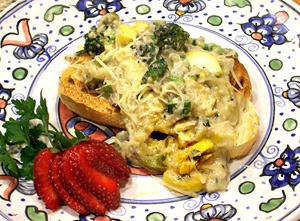 Toasted bread crumbs and croutons were sprinkled over vegetables as a garnish or mixed in sauces to thicken them. Sauces of milk, cream, and cheese were great favorites, too. Here are a variety of side dishes for Medieval feasts adapted from period recipes. All the ingredients are historic and easy to obtain at a supermarket. These recipes can be made at home or over a campfire. They can also be increased to serve a crowd at a feast. 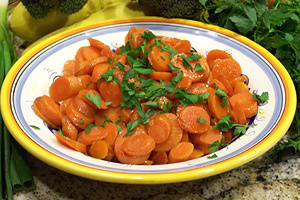 Orange carrots were first grown in Europe by the Dutch in the 17th century. However yellow, red, and purple carrots were part of the European diet since antiquity. Sometimes you can find heritage carrots for sale at the Farmer's market. You can also substitute young parsnips for some of the carrots. A shot of whiskey gives this dish a sweet aromatic flavor which is delightfully naughty. Go easy on the parsley and corriander. You can substitute apple juice for the whiskey if you prefer. In a skillet or saucepan over medium-high heat bring butter, sugar, water, salt and coriander to a boil. Add carrots. Cover and cook until tender (about 15 minutes). Do not overcook. Stir in whiskey. Cook uncovered, stirring occasionally, until liquid evaporates and carrots are glazed (about 5 minutes). Stir in chopped parsley. Serves 8 (¼ cup servings). Braising, a cross between steaming and roasting, gives these green beans a sweet, nutty flavor that is further enhanced by a sprinkle of olive oil and toasted almonds. I call this my Medieval version of Fried Onion and Green Bean Casserole. This is based on a recipe from 1545 that I crossed with another period recipe that included almonds. Other similar historic green bean recipes include currants, sweet wine, and butter. This is one of our campfire favorites but you can make it in a skillet at home, too. 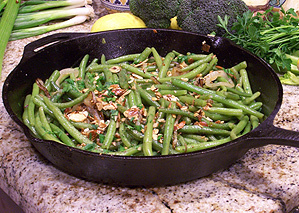 Trim the beans and place in a Dutch oven over hot coals and stir fry to toast them a little. Pour in water, cover with the lid and braise using top and bottom heat until the beans are bright green and al dente about 15 minutes. Do not overcook! While the beans are cooking, rub a little oil in the bottom of a skillet and heat until barely smoking. Add the almonds and toast over a high flame until they begin to turn brown. Remove the skillet from the heat immediately. Remove the almonds to a plate and set aside. Add the rest of the oil to the skillet and fry the onion slices without stirring until transparent on top and brown on the bottom. Remove the beans from the Dutch oven using tongs and toss them with the onions in the skillet until they are evenly coated with oil. Season with salt and pepper and add the herbs. Cook for a few more minutes then transfer to a warm serving plate. Sprinkle with toasted almonds. Variation: For a touch of sweetness, add 1/2 cup raisins or Zante currants and a splash of wine when you add the herbs. Serves 12. If you have never eaten a dish of collard greens, kale, or chard you are in for a treat. It is a little like spinach but without the mushy texture and the flavor is milder. Fresh greens look like huge leaves sold in 1-lb bunches. Don't be alarmed by the huge pile of leaves you start with. They reduce to a small amount in the hot water. Leeks look like huge green onions and have a wonderful flavor when cooked, sort of a cross between onions and creamy mashed potatoes. This dish was a staple of the Middle Ages and you will see why when you taste its buttery goodness. Wash the leek and cut into ¼" slices. Wash and tear greens into large pieces and remove the ribs. Fill a large pot with water, add salt and bring to a boil. Boil leeks and greens in salted water for 5 minutes, or until soft but still bright green. Strain in a colander and pat dry with paper towels. Just before serving, melt butter in a skillet and toast the breadcrumbs. Toss the greens with buttered crumbs in the skillet. Salt and pepper to taste and cook over low heat for 8 to 10 more minutes. Garnish with a sprinkle of breadcrumbs. Serves 6. Sippets (or Sops when put in soup) are pieces of fried toast that form the base of this dish, which is something King Henry II could have been served. The sauce is similar to white sauce but it is made the Medieval way—with breadcrumbs instead of flour and seasoned with saffron to give it a golden yellow color. It's a perfect supper dish to use leftover chicken but you can also replace the chicken with 2 chopped hardboiled eggs, 1/2 cup ham, or 1 additional cup of vegetables. The recipe calls for white bread, but I also love the way it tastes when I make it with whole wheat bread. For a fancy dish, cut the crusts off and cut the bread into triangles. Toast the pieces in butter and stand them upright in the Golden Chicken. These toasts were called "flame points" because they were supposed to look like flames. 1 cup (4 oz) aged Guyere, Swiss cheese, or sharp Irish cheese, grated fine. If using saffron, crush and dissolve the threads in the milk to develop the color. Cut the crusts from the bread slices, toast and crush to make crumbs. Butter both sides of the bread slices, reserving 1 tbsp of the butter. Place the slices on a cookie sheet and toast in a 350° oven until brown, about 10 minutes or fry them in a skillet to make the sippets. Set aside and keep warm. Meanwhile, pour the oil in a skillet over medium high heat. Cook broccoli for 2 minutes then add onion, celery, squash, and garlic and cook together until all vegetables are just slightly tender. Lower the heat and add cooked chicken, breadcrumbs, green onion, parsley, milk, saffron or food color, and the reserved butter. Cook and stir over low heat until the sauce is blended. Fold in the the grated cheese holding back a couple tbsp for garnish. Serve forth on sippets with grated cheese sprinkled on top. Serves 6. If you want to add this article to your list of favorites or email it to a friend, please use this permanent URL, https://stores.renstore.com/food-and-drink/vegetables-fit-for-a-king. Permission is granted by the author to quote from this page or use it in handouts as long as you include a link back to Renstore.com.